As soon as I read at launchpad that there is a logo contest, I just couldn't resist, this is my chance to give something back! Although I'm not very experienced as far as logos come in question, I spent my 3 hours in front of a Ubuntu GNU/Linux operating system and playing around with Inkscape. If you become familiar with the few tool buttons on the side and their shortcuts (e.g. "select" is F1), you'll end up making masterpieces - OK, maybe I exagerate, but you will be surprised how easy it is to create a logo. To checkout my submission click here. I've attached a PNG image of my SVG source so you don't have to *click* and *click* and *click* all over the place. The only thing that Inkscape didn't have for you to use instantly was a triangle, a mathematical basic shape. Beyond that point, I am excited to have mastered yet another pointless part of imaging (no offense, but it's definitely not related to my future profession). I was rolling on the floor laughing when I first heard about this. Emir Kusturica has symbolically burried "Die Hard" (or "ДИЕ ХАРД" as it wrote on the cross above the "grave") in a "Graveyard of bad films". OK, maybe the director wanted to pass his message that the film series wasn't good enough, but you can't say it's not HILARIOUS! Although I didn't personally like much of Kusturica's films, he has won two Palm awards so far, proving that at least some people respect his filmmaking geniousness. By the old calendar (see Julian calendar) today's the first day of 2008. 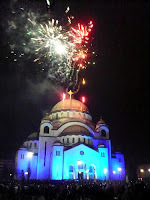 It's sort of a family tradition to celebrate new year by the old calendar here in Serbia. Unfortunately for me, I got sick the day before. 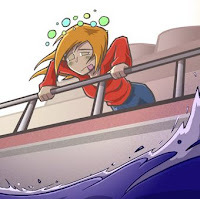 To make matters worse, a headache and fairly high temperature were presented shortly after the "sailing-at-sea" nausea feeling to the symptomas, therefore I had nothing else to do than start treating myself with a doze of a domperidone-based anti-emetic drug and paracetamol. So, 2008 - new year, new expectations, new destinations, new romance, new... everything! May this year be the best for you and your family, enjoy it as much as you can, just don't forget to grab a book from time to time.